Attention New Yorkers! This event is FREE and open to the public. Please join us as we meet and collaborate with aspiring and seasoned creative activists. Why is it that artists’ collectives typically focused on political activism have emerged in such numbers over the past few years? What are the specific advantages to working in a group context, but also what are the disadvantages? How does the art world (both local and global) perceive the work made by activists, informal groups, collaborations, and collectives? What is the difference between a collective as opposed to an art’s organization? 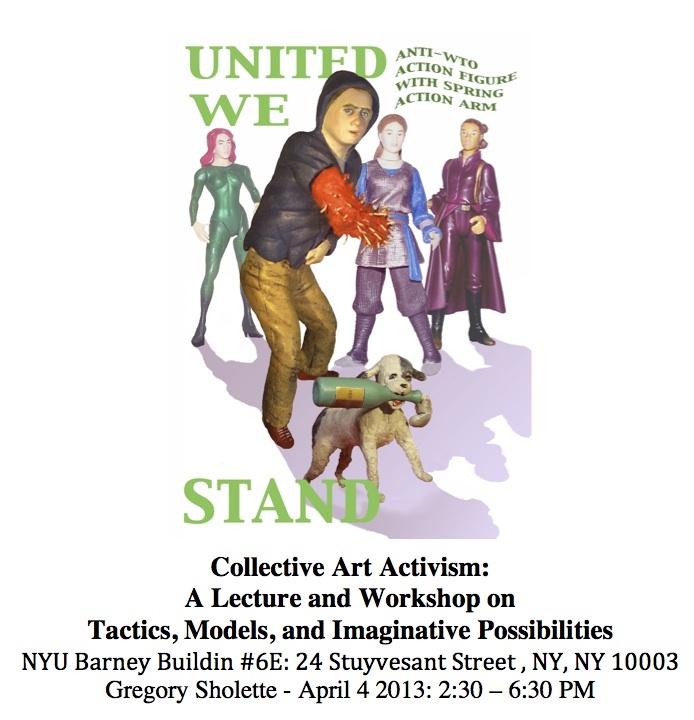 Artist, writer, and activist Gregory Sholette will address these questions in a lecture presentation before leading a workshop on the theory and practice of contemporary collectivism in which participants engage in activities focused on collective problem solving while debating the practical and aesthetic issues related to civil disobedience and tactical media. Drawing on several decades of cultural organizing in New York City participants will seek to develop alternative models for how artists can work together, make decisions, avoid conflicts, engage in social change, and sustain their activities over time. Gregory Sholette is a New York-based artist, writer, and founding member of Political Art Documentation/Distribution (PAD/D: 1980-1988), and REPOhistory (1989-2000). A graduate of The Cooper Union (BFA 1979), The University of California, San Diego (MFA 1995), and the Whitney Independent Studies Program in Critical Theory, his recent publications include It’s The Political Economy, Stupid (with Oliver Ressler, Pluto Books, 2013), Dark Matter: Art and Politics in an Age of Enterprise Culture (Pluto Press, 2011);Collectivism After Modernism: The Art of Social Imagination after 1945 (with Blake Stimson for University of Minnesota, 2007); and The Interventionists: A Users Manual for the Creative Disruption of Everyday Life (with Nato Thompson for MassMoCA/MIT Press, 2004, 2006, 2008), as well as a special issue of the journal Third Text co-edited with theorist Gene Ray on the theme “Whither Tactical Media.” Sholette”s recent public art installation “Torrent,” was on view at Printed Matter Books, his other past installation projects include: “15 Islands for Robert Moses” for the Queens Museum of Art, “Mole Light: God is Truth, Light his Shadow” for Plato’s Cave, Brooklyn, New York, and the collaborative project Imaginary Archive at Enjoy Public Art Gallery in Wellington New Zealand. He is an Assistant Professor of Sculpture at Queens College: City University of New York (CUNY), a visiting faculty member at Harvard University, and teaches an annual seminar in theory and social practice for the CCC post-graduate research program at Geneva University of Art and Design.